Lady and the Blog → Style → Can I Get Your Vote? In The Running To Attend The People’s Choice Awards With CVS! Can I Get Your Vote? In The Running To Attend The People’s Choice Awards With CVS! Hey party people! There’s a few more days left to vote for me on the website for the People’s Choice Awards. 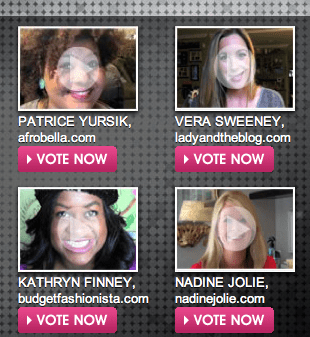 I’m battling 4 FAB beauty bloggers – so I need all the help I can get. We each made a video about what makeup we would wear if we went to the People’s Choice Awards with CVS. You can take a look at all the videos and see what we did. Then… if you don’t mind… I would LOVE a vote!! Click here to help me win that trip. MUCH appreciated!! Previous Post: « I Finally Got My iPad Back: Thank You VTech InnoTab!